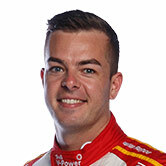 Scott McLaughlin is looking dangerous on both the soft and hard Dunlop tyres ahead of back-to-back qualifying sessions at the Clipsal 500. The young Kiwi recorded the fastest time in practice two on the softer compound – breaking the practice lap record set last year by Shane van Gisbergen – with his 1min19.6977 lap. It’s the first time the drivers have used the soft tyre at the Adelaide street circuit, and teams were looking for valuable information that session before qualifying on the soft rubber in the first of two back-to-back 10-minute sessions this afternoon. McLaughlin was just 0.0467sec ahead of Jamie Whincup – who he had an incredible battle with at the Clipsal 500 in 2014 – but was tentative to talk up his chances this afternoon. “It’s feeling good, I’m not going to talk my stocks up just yet,” he said. He and engineer Richard Hollway will look at the data to improve not just the car, but McLaughlin’s approach around the circuit. 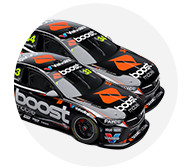 Whincup was just ahead of his new teammate Shane van Gisbergen, with defending champion Mark Winterbottom and last year’s Clipsal 500 winner James Courtney completing the top five. Drivers started the 40-minute run on the hard tyre, with Lee Holdsworth first to try the soft. He easily went to the top of the order, and others followed right up until the last minutes of the run. Garth Tander went as close as he would want to the wall at turn eight, and Chaz Mostert seemed to settle in, despite registering 20th at the end of the session. Click here for full session results. Qualifying kicks off at 3.45pm local time.